The Neue Schule NS Thoroughbred Weymouth (45 degrees forwards) has been designed for the sensitive mouthed horse, and is a particular favourite for riders of Thoroughbreds. The 12mm mouthpiece offers a subtle convex shape, angled at 45 forward to the 7cm cheek shanks. This uniquely designed Meue Schule weymouth ensures that when the rider takes a contact gentle, uniform pressure is applied to the widest and least sensitive part of the tongue which help the horse to relax and improves comfort. 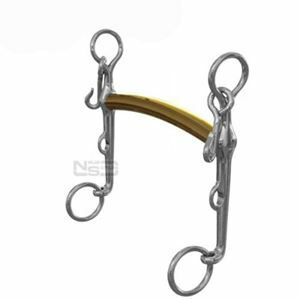 The design of the NS Thoroughbred Weymouth dramatically reduces the risk of contact with the thinner, sensitive, outer edges of the tongue and bars of the mouth ensuring your rein aids are delivered with clarity. This NS weymouth bit remains still in the mouth and does not roll forward on the tongue leaving plenty of room for a regular or thicker width bridoon.